Jamnagar: Defence Minister Smt. 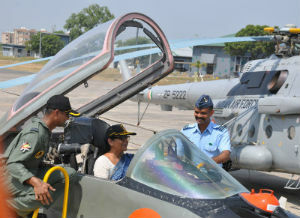 Nirmala Sitharaman was on a maiden visit to the Air Base at Jamnagar, today. She was received by Senior Air Staff Officer, HQ South Western Air Command Air Marshal DS Rawat and Air Officer Commanding Air Force Station Jamnagar Air Commodore Sanjai Chauhan. She was briefed on the significance of Jamnagar Air Base and the role and nature of air operations undertaken. 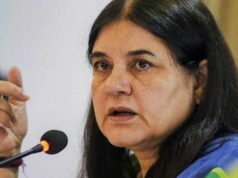 A Static Display of various aircrafts that had operated from the base and weapon systems were shown to the Defence Minister during her visit to the Air Traffic Control Center. She also interacted with the air warriors at a ‘Barakhana’ organised in her honour.